It is finally happening! A brave, but logical move. We used to talk about the mobile web vs. the full web. But as we’ve now learned, not even the users surfing the web using a desktop or laptop wanted the “full web”. Users want a fast, lean, relevant, free-for-clutter web. Which was the focus of the “mobile web” (and WAP before that), since the very beginning. This way of thinking is now known as “Mobile First”. And now it is actually happening! It is a paradigm shift. 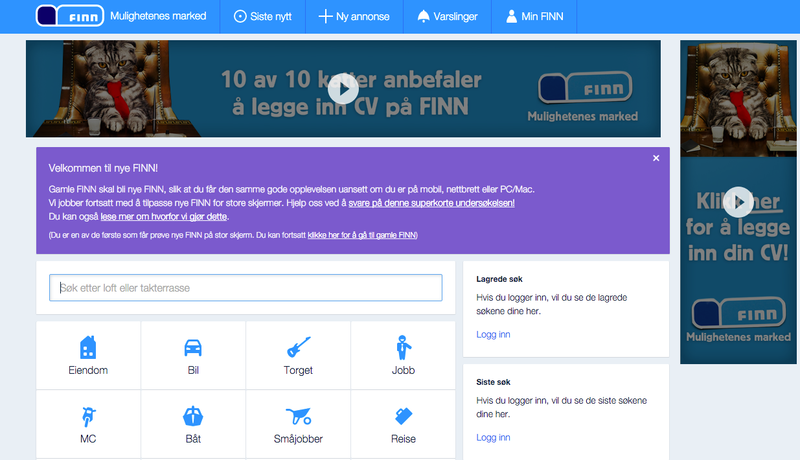 Finn.no announced that they will shut down their “full web”, and offer a “scaled up version” of the “mobile web”. If you think about it, it makes total sense. Mobile devices now account for the majority of visits across most sectors in Norway, including Finn.no’s classifieds sector. Finn.no took mobile seriously from day one, emphasizing on the unique characteristics of mobile, without thinking of them as limitations compared to the full web. A true Mobile First approach. …time went by, and here we are today and the “mobile web” is better than the “full web”. Great job finn.no!